I recently bought a couple of PCB's with slight faults, this one seems almost there so I thought I'd ease into things by looking at this one first. The PCB is pretty clean but has some glitchy sprites. I also noticed it seems to have some kind of adapter instead of one of the custom chips, is that factory or some sort of bootleg thingy? I've got a logic probe but not much else! I intend to buy a Rom burner once I find what a decent one is so I can verify whether roms are good or not, I need something to burn older stuff and Model 2/3 stuff as well. 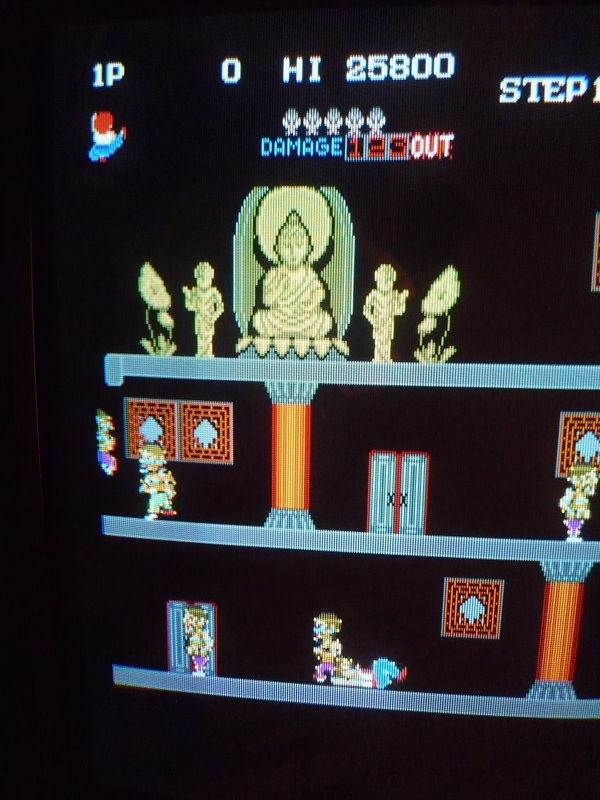 I've tried reseating roms/pushing down on them etc tna. Can anyone please give me some pointers as where to start faultfinding using the probe. I'm not even sure where I should be connecting the alligator clips to either! I know I'm probably asking something that has already been asked a million times, but, we all had to start somewhere! 1st thing I would try is adjusting voltage. Don't know if it's a bootleg but if it is they sometimes need a sightly higher voltage. I have a mr do that does the same thing until I up the voltage a bit. It was sold to me as an orginal mate. There's some Konami silkscreening on the PCB so I'm 99% sure it's an orginal. Voltage is 5v at the edge connector and 4.9v at the chips at the back of the board. I know I need more stuff to faultfind which I'll buy in due course, but I have a MegaZone board with a faulty ram issue and I just wanted to ease into using the probe before tackling that. I just don't know how or where i should be connecting the alligator clips on the probe. I thought the thing used batteries. Certainly looks original judging by the silkscreening and Konami logo on the chip(s). Could well be a bad ROM, get a cheap MiniPro programmer to read them, it can program older chips too (not 2716s, but will do 2732s instead). Attach the probe leads to +5v and ground. Good luck, it's a great game, used to play it on the Spectrum, surprisingly good conversion. Yeah I really enjoyed playing this BITD, I could spend hours and hours on a credit. The music is ace. I've been testing the probe a bit but I seem to have a knack of reseting the board when probing. I'm not sure what setting to switch the probe to, TTL or CMOS and MEM or PULSE....I guess I have to read up a bit more then before I cause damage. I've also been reading up on programmers but can't decide which one to go for as I don't know what chips are common. I need one that burns older stuff like chips on the older Konami PCB's to larger chips from Model 3 games and maybe the odd Naomi bios as well. I'd like to be able to check if some chips are good or bad as well, but from reading some forums it seems to be a bit hit and miss with some chips. The feeling I'm getting is to replace all fujitsu chips as they are known to fail? Either the Wellon VP598 or GQ-4X4 seems the one to go for? What a minefield it all is!!! 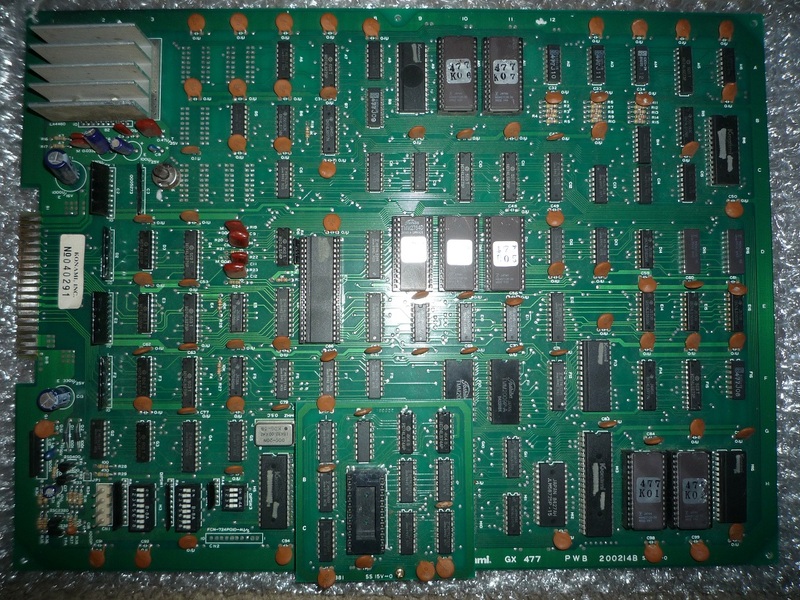 Board looks original but with Konami 083 custom replaced with genuine Konami alternative board. A video of the issues might be easier to understand. The video logic in this board is quite complex by comparison with many contemporary Konami designs, not simple... but the vast majority of it seems to be working well. Thanks for the input mate. Ah, so the adapter board is original then, that's interesting Konami did that. I've seen boards with the custom chip and with these riser boards fitted but I didn't know if they were aftermarket or not. If one of the customs is bad, I do have a spare Time Pilot 84 PCB which shares some of the same customs. Unfortunately the customs on this PCB are soldered rather than having sockets on the TP84. that looks like either eprom or sprite ram addressing. use mame to see which eproms are the sprite graphics,identify what type of eprom they are,look up the pinout then check the address lines and the data lines.If one isn't pulsing that might be your problem. https://docs.google.com/spreadsheets/d/1iB9BJaEpAufgKaz758FiDDekUH8JreoTn276yPqD-kk/edit#gid=0 has a pretty definitive list of customs on this vintage of board. Thanks, I'm not sure how to use Mame to find out something that mate. I've downloaded the Kicker installtion manual with the schematics so will have a look at the pinout when I have some time to tinker then give it a good probe! I was looking at that page yesterday comparing the customs on the different Konami PCB's, the only one on Kicker that's not shared with Time Pilot 84 are the 504 and 085 customs. I guess I need to buy a burner to check the sprite ROM's then take it from there! Thanks again for the inout guys. Back on my maine pc now. Are there many chips compatible with these that are normally used on this era of games? If it was me I would swap the ROMs at H14 and H15 and then take a look. If the locations of the glitches move... It is the ROMs... If they don't it is the logic. H14 and H15 should be the same size... Please check. Good idea.The graphics will be messed up but you should be able to see if the lines are in different places on the sprites. If swapping the eproms makes no difference look up the pinouts for the eproms and check the data and address lines to see if they are all pulsing. The 27128 and 2764 are common eproms that most burners can handle. I have a cheap TOP853 that does all standard types of eproms including these. I just swapped around the ROM chips whilst I still have the PBC out. Just like you guys said, it seems to be a logic problem as the lines are in the same place. I'll have a mooch on the schematics and see if I can see what pins to probe. I'm still working out what burner to buy. I may try and snag a cheap one from somewhere to play with before I buy something more expensive for model 3/Naomi stuff. I don't completely understand the operation of this board but I think the two RAM chips above the ROMs are a line buffer type arrangement so it could be one bit of them. I think they are read and written by the 502 custom? I will bow out now and watch someone more competent step in. My copy of the schematic is barely legible but I think I would swap/replace those RAMs next. So I've had a bit of a probe whilst the attract screen was running and found the following on the 2 ROM's, KO1 and KO2. Comparing the 2 ROM's, KO1 has a low pulse on one pin (LH side 4th pin up) whereas the KO2 Rom is stuck low. Is this something to be concerned about? I'm trying to read the schematics but the writing isn't clear, I guess tracing the traces using a continuity test is the next option to try and trace further back in the circuit. By the way, I've bought an older Wellon 290 for what I think is a reasonable price. Need to get a rom eraser and some spare roms for my other boards now then. Just edited the previous post as I got KO1 and KO2 mixed around. We must be reading the same schematic! Man it's so difficult to read. I think you are correct in saying custom 502 and also 503 has something to do with the graphics. I'm tempted to swap out the 502 and 503 customs from my Time Pilot 84 PCB but would need to fit sockets to the Shaolins Road PCB, I don't have any sockets though, nor do I have a decent soldering iron but that the next thing on the list to buy. The customs are hard to come by so don't tinker unless you need to but it might come down to that, hold tight on those I reckon. The video hardware on this board is interesting... I think a 6116 RAM is used for character generation along with the two GFX1 ROMs... you have no problems there. On the sprite side there are two RAM chips (marked strangely as 2009 on the schematic??) for sprite selection, then the two GFX2 ROMs and some bit moving logic and finally a pair of 2149 fast RAM (1Kx4) chips which I think forms a type of line buffer (?). I believe the 502 is a simple blitter for the sprites to line buffer but I'm not sure. FWIW I have a bootleg in front of me which has 3x M58725P (aka 6116) and 2x HM6148P (aka 2149). And here's me thinking that the older boards would be easy to start off with! To be honest, it's interesting learning how PCB's work, so thanks for explaining things nicely to me. I've just been probing around some chips and noticed a couple of legs on chips at c10 and c11 are showing high + low at the same time but pulsing, maybe it's pulsing high to low super fast that the probe can't keep up? Do you have any idea if that's normal? I thought chips were either pulsing in a high or low state? I think once I get the burner I'm gonna dump the ROM's and test them in Mame and see what happens. That should rule out for sure if the ROM's are either good or bad. I never ever thought I'd be using Mame as a way of testing stuff, it's a shame you can't somehow use Mame to compare how the chips pulse away. A graphic of the PCB with flashing pins that you could zoom in on would be awesome.